1 Death of Insanely Overpowered Fireballs: Something is very wrong with the universe. 2 Death of Insanely Overpowered Fireballs: It's been in a destructive spiral of spatio-temporal paradoxes for some time now. 3 Death of Insanely Overpowered Fireballs: I need to trace this back to the original causality violation that set it all off. 4 Death of Insanely Overpowered Fireballs: I know where I need to go. 6 Death of Insanely Overpowered Fireballs: You know, it's bigger than it looks in photos. I made a special trip into the city to take the final two photos. Unfortunately even at minimum aperture the depth of field was not quite great enough to have the Opera House and Insanely Overpowered Fireballs in focus at the same time. 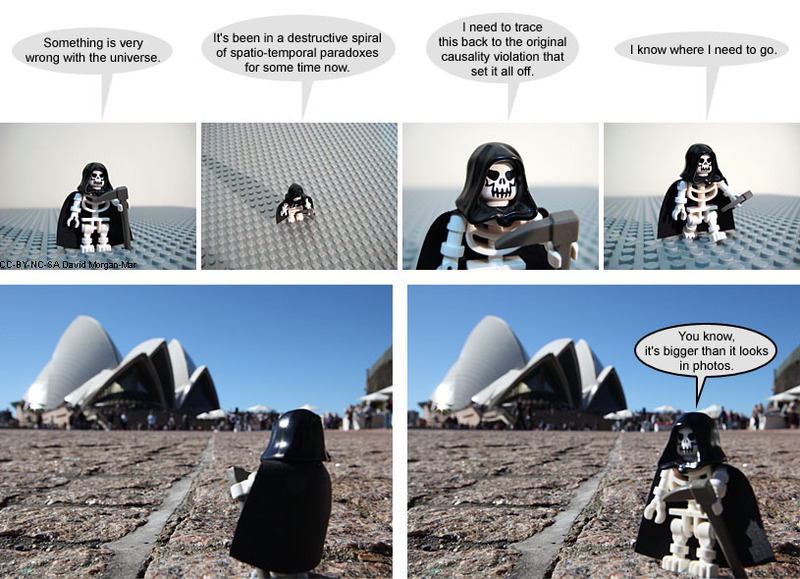 Yes, I could just have done it by compositing two separate photos, but then I'd have no excuse to go to the Opera House forecourt with a LEGO skeleton and lie down on the ground taking forced perspective photos now, would I? While I was doing this, a very curious woman came up and asked me what I was doing. I said it was for an "art project", to forestall several minutes of overly detailed explanation. Her next question was, "Oh! Do you travel all over the world and do this in front of other famous landmarks?" Last Modified: Thursday, 7 October 2010; 03:11:01 PST.